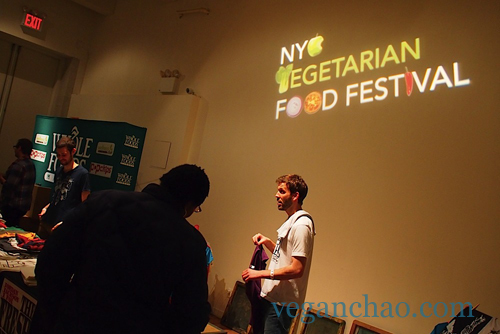 The second NYC Vegetarian Food Festival kicked off this weekend and I had a lot of fun! 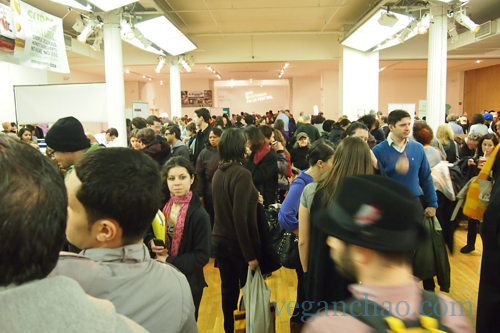 Sampling, talking to vendors and overall meeting like-minded vegetarian folk made slogging through the crowds all worthwhile. The line was still super long this year. 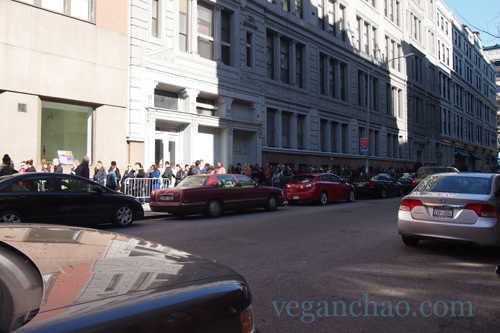 Inside, crowds stood on even more lines for samples from popular booths. I’m already a marshmallow fanatic, so this booth was an obvious choice for me. It was tough fending off like-minded mallow-lowers, but so worth it. I also really admire Sara for her great attitude and business model, so it is an overall win-win! A trip to her factory is long overdue! 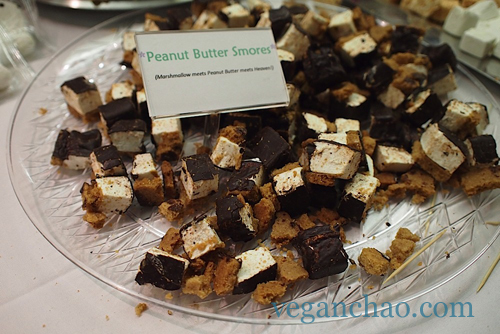 Lots of s'mores waiting to be stuffed into hungry mouths! 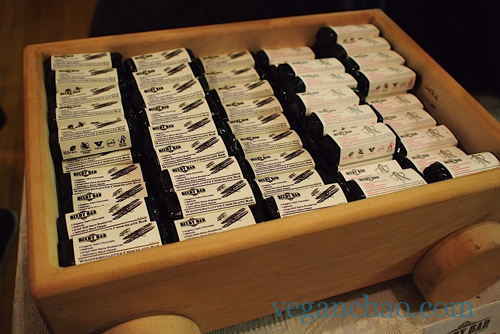 The best thing about Sara's booth was the ample amount of samples, which were ardently and timely replenished! 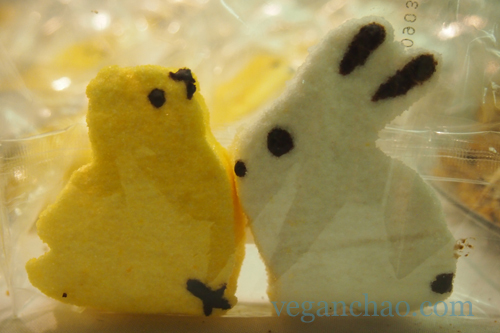 Vegan peeps on sale! Love the chick! 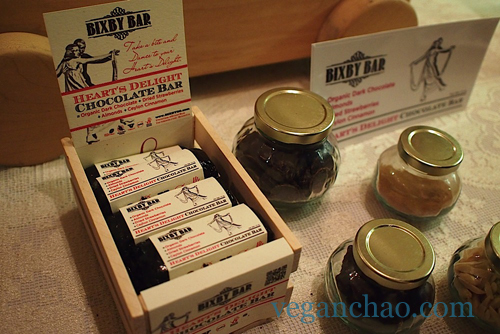 My favorite new discovery at the festival was certainly the Bixby Chocolate bars. 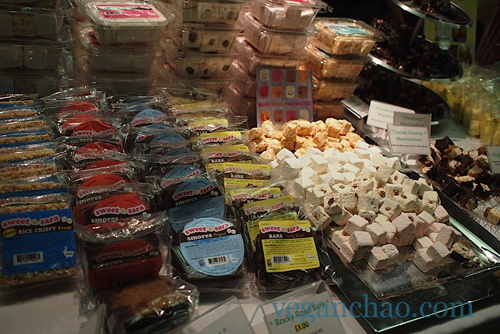 The two vegan flavors, Whippersnapper and Heart’s Delight were absolutely stellar with the dried strawberries and crunchy almonds. I liked the Whippersnapper out of the two more so because it had a great peppery contrast that really brought out the taste of the dark chocolate. I wanted to take them all home! This was one of the flavors being passed out as samples--the sweeter of the two. 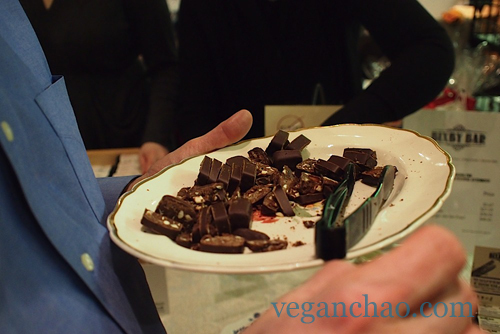 I loved that they had some nice porcelain plates and some sizable chocolate chunks! 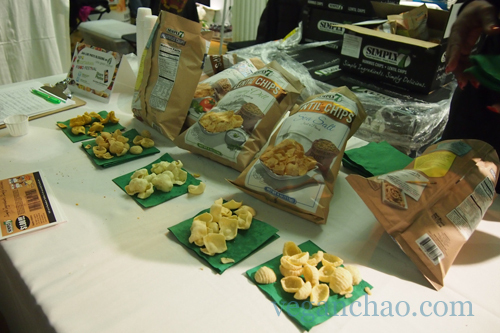 This “booth” was more of a rapid-fire sample-passing machine… the chip packs were a great size as was the hummus portions. 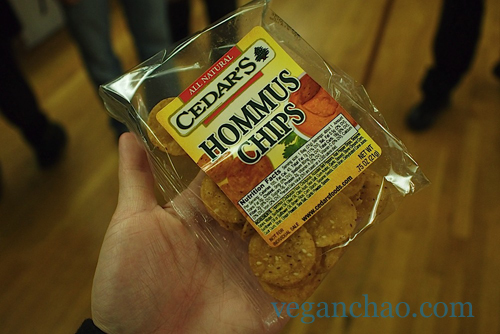 I really like the chips (they’re made primarily with chickpea flour), they’re a bit spicy and taste a bit different from a corn chip. I’ll certainly be picking up a full size soon! 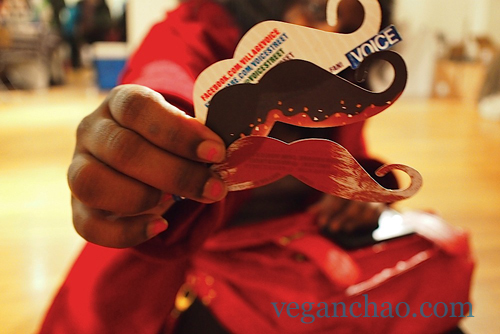 These packets were one of the better offerings at the fest. 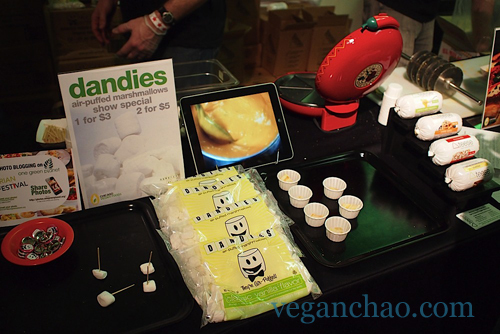 This was certainly one of the more crowded booths: cheezy nachos and their marshmallow dandies were being passed out like hotcakes! I don’t like the smell of their particular brand of cheese, it is quite reminiscent of stinky feet. The taste, however, was a bit better… the fact that it was easily meltable to make a nacho dip is appealing. 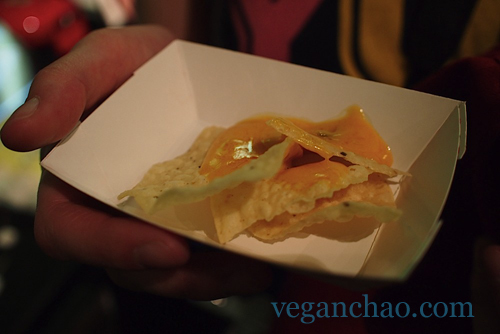 One of the samples at the teese counter was the nacho chips, mmm. The teese counter also had some freshly pressed quesidilla squares on hand. Dandies are not as good as S&S marshmallows, but for your own baking or melting for krispies, they taste just as good (and they're cheaper!). 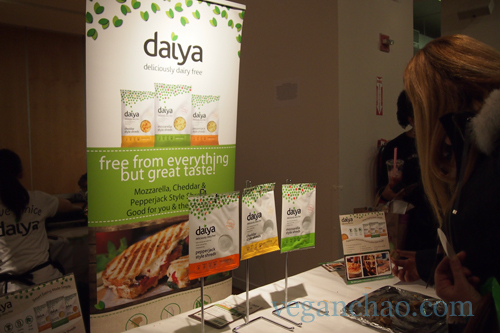 I’m a big fan of Daiya, but this booth was a bit underwhelming… not because of a lack of samples, but because of their attitude– they weren’t very helpful at all, though in all fairness were busy making more samples to be passed out, which went very quickly. Still, I do wish they were a bit more friendly. This booth had a bunch of coupons-- only 50 cents off, but since I love Daiya, I took a bunch! 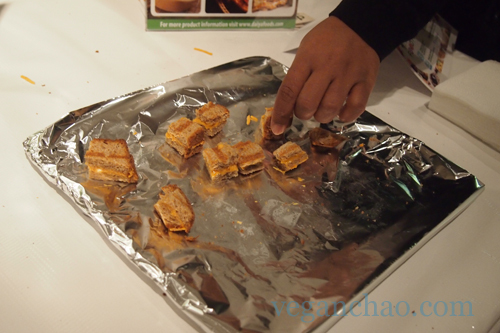 The grilled cheese samples went quick, I must admit I grabbed about 5 of them! Honorable Mentions: These booths were still great, but could’ve been better. I really love Earth Balance products and I wish this booth had a bit more samples that emphasized their great buttery spread, which is my favorite product from their whole line. The great thing about their booth was the $1 off any Earth Balance product coupons they had– the bad was the expired ones for their new product, their new mayonnaise spread. Lucky for them, the booklet given out in the front of the house had a coupon too. Phew! The chocolate milk was my favorite flavor, of course... I wanted a whole cup! 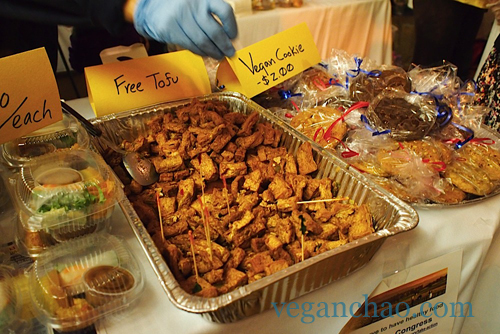 This booth had a great big vat of seasoned bean curd that came in nice fat pieces. The lady at the booth was nice and certainly did a good job telling me about their cause, all things we like to see in an effective booth! They also gave out samples of their mac n’ cheese, which I can say in all confidence is very good (not too expensive either, visit one of their restaurants when you can). Nice, hefty chunks of bean curd... a little cold but still yummy! Not my favorite beverage of all time, but this booth had plentiful little cups of tea that were more than half-full, which was appreciated. 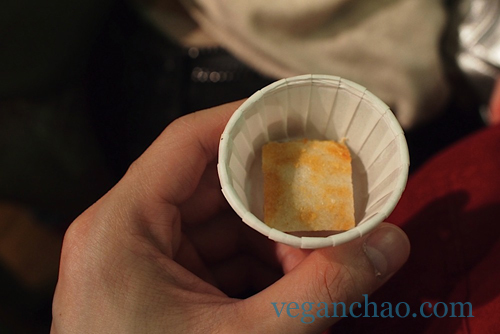 I hated the people who filled the cup up to about a nail-length… and I’m glaring at you, Vegan Bodega! My favorite flavor was the half and half. 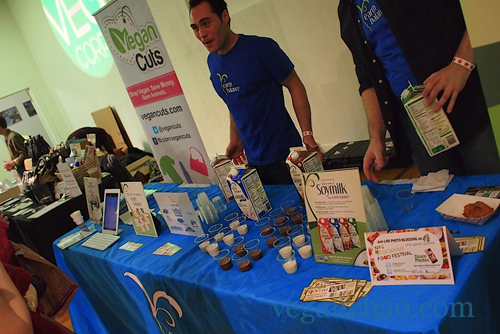 This booth had a lot of samples at the start of the festival... I guess everyone robbed them blind by the time this pic was taken! 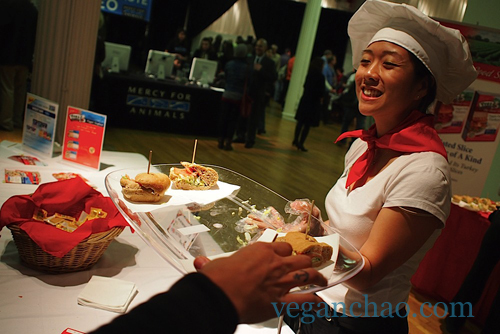 This booth was right by the entrance with some substantially sized sample sammies, definitely a good portion. Bravo! Cute chef outfit and some pretty good sized sammies! 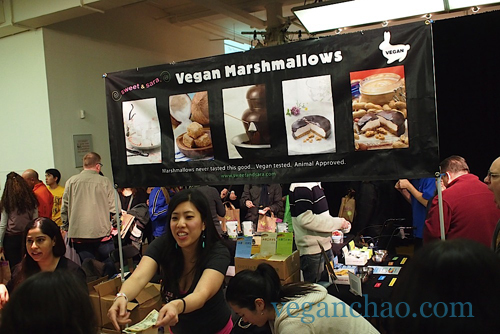 Hit and Miss: Some things should not see the light of day… but luckily, not too many booths fell into this category! I really hated this drink. 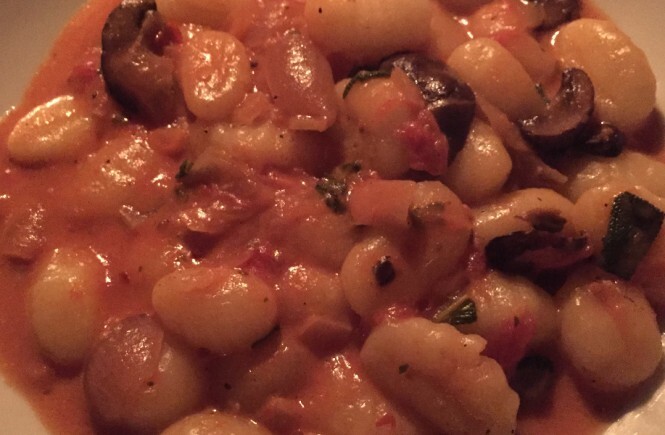 It tasted like some salty, spicy liquid that was trying to be sweet… it just didn’t work for me. 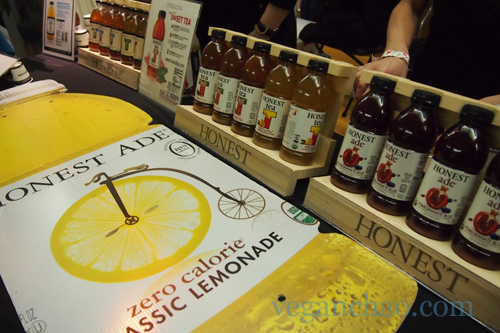 I went straight to the Honest Tea booth to flush out that nasty taste. This booth had some really nasty samples... bleh! 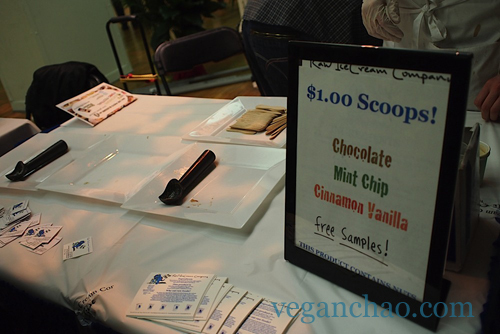 I thought their ice cream was good… the sample size was extremely stingy. The “cup” they were selling for $1 was only one scoop, which was ridiculous to me because it was pretty much sample size. They also gave out the tiniest samples imaginable. 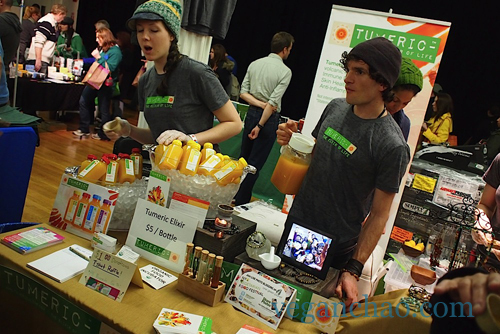 I know your product is expensive to make… but if you’re at a festival, don’t you want people to try your product, not keep it to yourself? $1 for a small cup? Really? 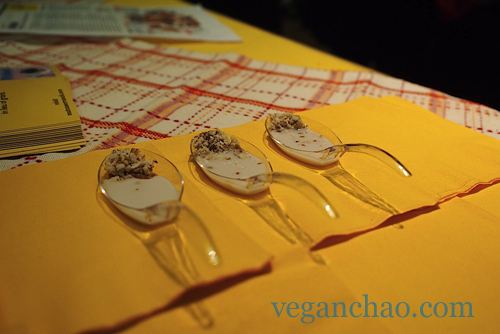 Almond Milk Cereal samples- I like the way they presented it, though I am personally not a fan. 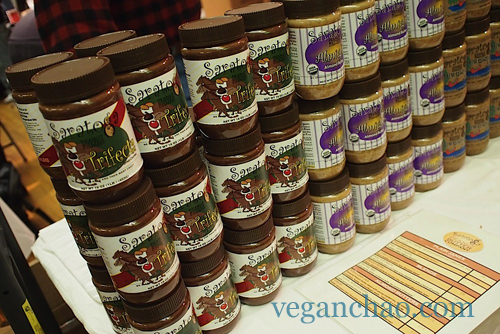 Saratoga Peanut Butter - flavors like dark chocolate and maple were really yummy! 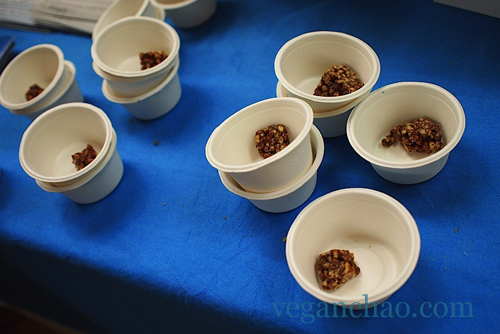 Some vegan rice bar samples. 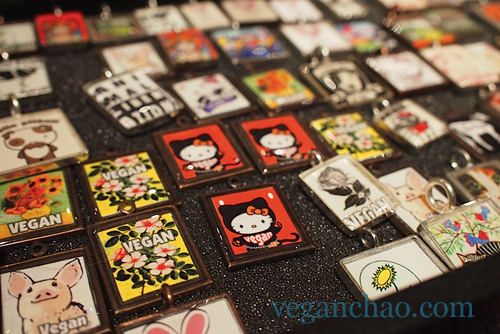 I want a Hello Kitty charm! 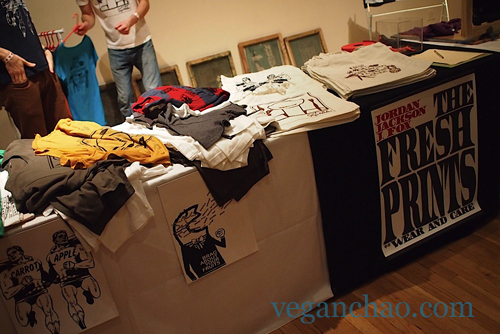 Some vegan threads for sale by the door. 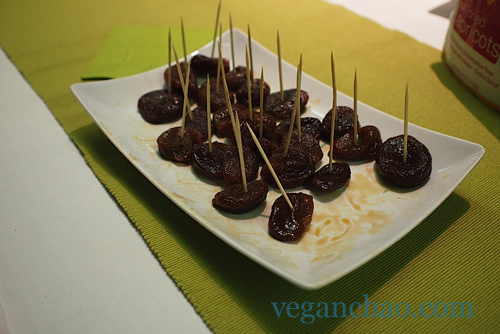 Some healthier samples of dried fruit. Me and Sara... I was super excited! 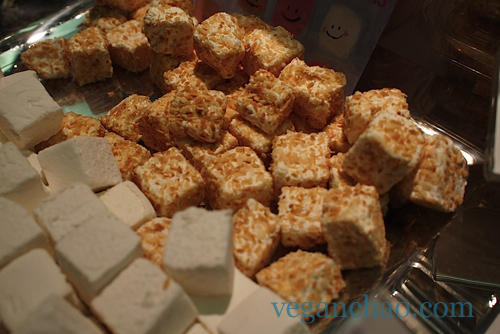 Plenty o'coconut mallows to go around. 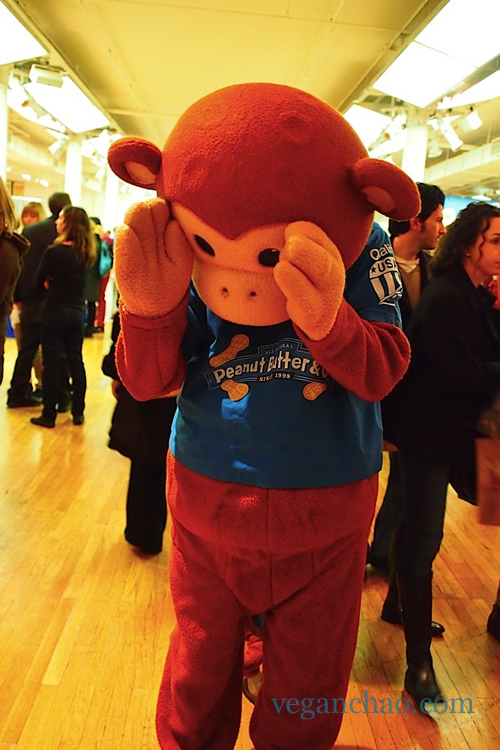 Peanut Butter Monkey plays peekaboo with a little one. 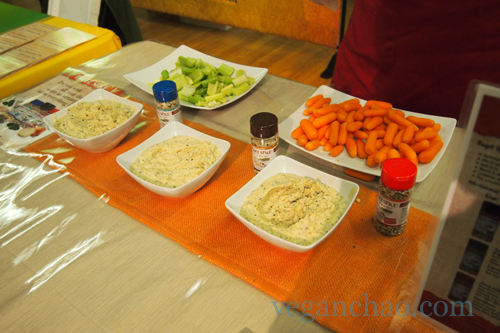 The Bagel Spice booth - so healthy! These chips were really good, crunchy with a bit of zing. 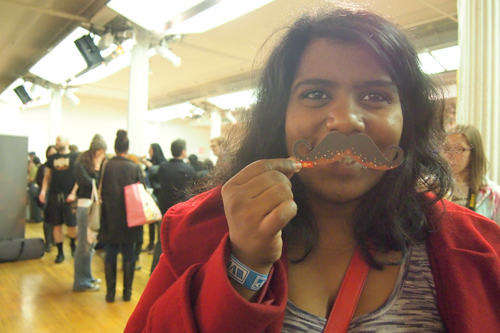 Lisa armed with some Village Voice 'staches! 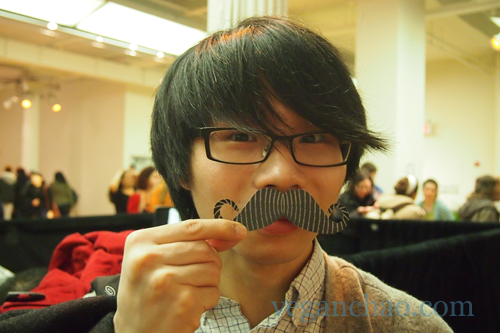 Ray gets 'stached too, is this a new disease? Can’t wait for the next fest. See you guys next year! 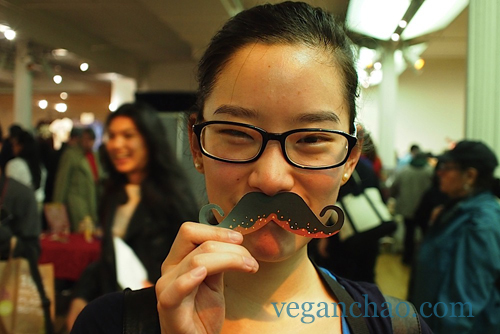 Being vegan means so much more than just a diet. It's a way of life and though it can be tough, I'm here to give you tips, tricks and guidance on how to live a greener, leaner, kinder life, one carrot at a time! 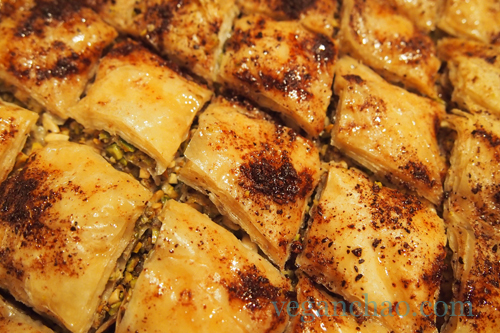 Sound yummy? 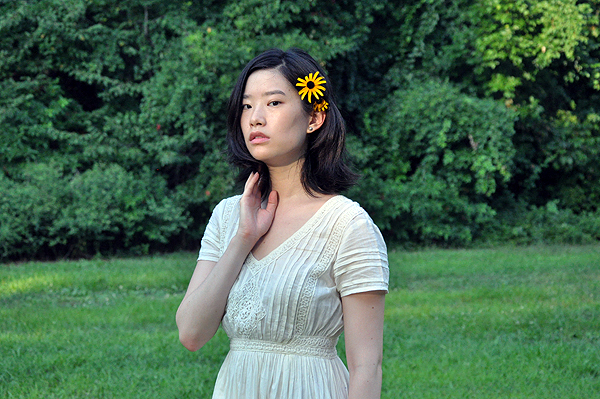 Subscribe here for more good stuff!